A Boutique Narrowboat holiday is a unique rural retreat. You may never have experienced anything like it but please don’t be alarmed if you’ve never been in charge of a boat before. Canal boats are not difficult to operate. So leave the worrying to us – we will provide all the training you need to get underway on your first afternoon, teaching you how to navigate locks and operate the boat, so that you can enjoy your holiday afloat with complete peace of mind. You can read more about our training for novices here. 1. Choose your dates and book online. 2. We will email you some information to read before your holiday. We will send you a link to a tutorial on YouTube to help prepare and a list of what’s on board and what you should bring. 3. Arrive at the marina at 2pm on your first day, where we will get you settled in and show you where to park your car. 4. Join us on board for your induction. We will explain the safety equipment, show you how the boat works, how to navigate the waterways and operate locks and bridges. We will talk you through the boat manual and help you practice your maneouvers at the tiller, as well as discussing your chosen route with you. 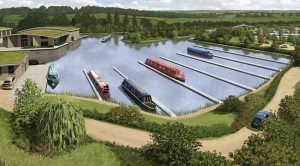 Our comprehensive boat induction is approved by the Canal and River Trust. 5. Finally, when you are confident, we will hop off the narrowboat as you cruise on to enjoy your first Boutique Narrowboat holiday with each other, on our beautiful Grand Union canal. Travel blogger and novice boater, Jet Set Chick has published an in-depth review of her holiday on Lesley Ann. You can read her adventures here.